Cloud gaming service OnLive released a major update to its In-Browser Gaming capabilities at E3 2012, enabling publishers/retailers to offer one-click, instant play of hundreds of games from OnLive’s top-tier library or any partner-provided game, in nearly any PC or Mac web browser, and soon, from web browsers of OnLive-enabled TVs, tablets or smartphones. No signup or login necessary: In just one click, gamers jump into a white-label gaming experience completely defined by the retailer or publisher’s website, from startup to return dialogs to window skinning, utilizing any OnLive features, including OnLive MultiView in-game live spectating, multiplayer, voice chat, touch support and secure transaction interfaces. 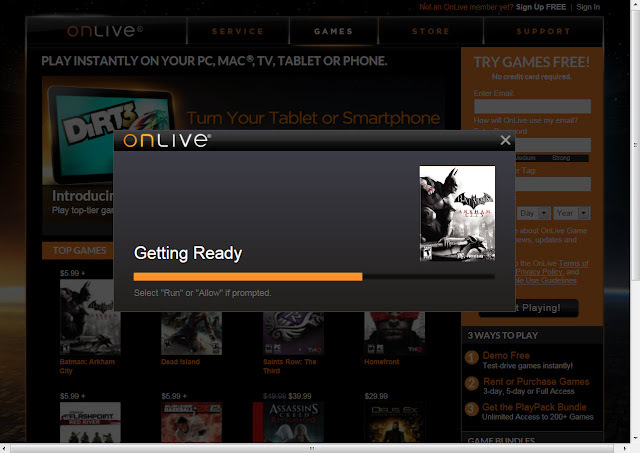 OnLive In-Browser Gaming is live now in North America, Europe and soon worldwide. Check out any game trial in OnLive’s game catalog at www.onlive.com/games/featuredgames to see OnLive’s In-Browser Gaming service in action, skinned with a simple interface to showcase base functionality. OnLive In-Browser Gaming was designed for easy integration into any web destination, such as partner websites, Facebook pages, tweets or fan sites. Using standard HTML or Flash, the partner website both skins and controls the flow of the entire experience. A simple URL launches any game, whether from OnLive’s library of hundreds of top-tier titles or partner-provided. Upon completion of gameplay, the website can decide whether the user returns to the web page for download, for a disc upsell to specific platforms, to purchase the game for continued play through OnLive on the device they are using, or any combination of these choices. No more lost sales (and disappointment) to users who can play a cloud demo on their device, but lack a high-end PC or platform that can play the game. Plus, OnLive opens up new opportunities to sell games for OnLive-enabled TVs, tablets and smartphones. This is a nice jab that OnLive took at Gaikai. Many people have criticized Gaikai for providing high-end cloud gaming demos and after the demos end, redirecting people to high-end PC games purchases and downloads. Many people are not able to run the full high-end PC games that Gaikai streams to their machines and so using Gaikai's cloud gaming demos is moot for them. Of course Gaikai plans to offer full cloud games in the future like in their partnership with Samsung, so that may change in the future. Since both OnLive and Gaikai now support In-Browser cloud gaming demos I've tried to launch a demo of a game that is on both services to compare the loading times. That game is Assassin's Creed: Brotherhood (OnLive Demo / Gaikai Demo). OnLive launched the game in about 40 seconds and Gaikai took around 80 seconds to launch the game. This means that OnLive is roughly twice as fast as Gaikai in launching In-Browser cloud gaming demos. Of course some games load faster than others, but that is the case for both services with some variances possible because of unknown factors in their data centers. This result doesn't bode well for Gaikai since cloud gaming demos are the crux of their business and for OnLive these demos are nothing more than promotion for which game publishers don't have to pay, unlike with Gaikai. Another thing that OnLive gets right is the loading bar which proceeds swiftly from 0 to 100 exactly one time, unlike Gaikai which has a loading bar that can restart multiple times and you can't tell when the game will really start up. 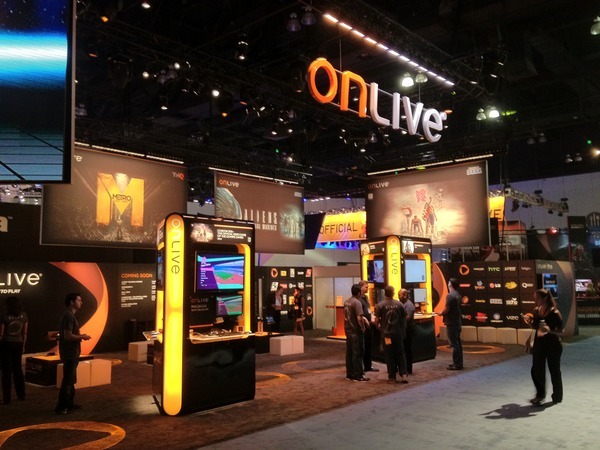 In addition to adding unique social dimension to OnLive gaming, OnLive’s exclusive MultiView in-game live spectating provides an unprecedented marketing vehicle. OnLive MultiView can be used to showcase experienced players at more advanced levels of a game, to provide context for multiplayer games through voice chat, or to show promotional videos or upsell other games during demo play. 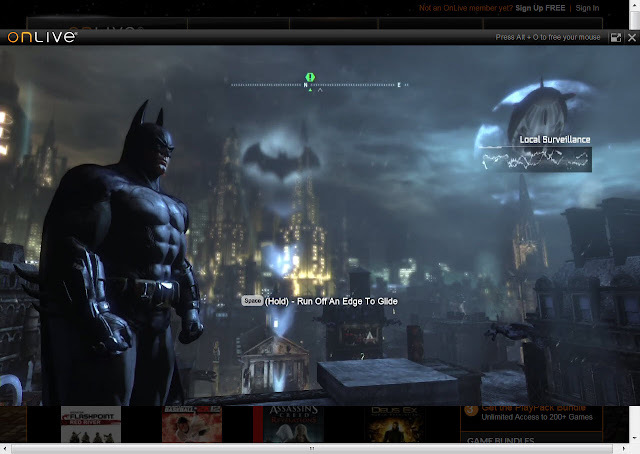 OnLive In-Browser Cloud Gaming is virtually friction-free for PCs and Macs. First launch delivers one-click instant play for any of the millions of gamers who have ever used OnLive, or two-click on first launch if the gamer has Java, and one-click thereafter. For all others, on first launch the tiny OnLive client installs in just a few seconds (no Java needed). Fast and easy, OnLive delivers instant gratification with zero or minimal overhead. OnLive elaborated on how this works for a user. 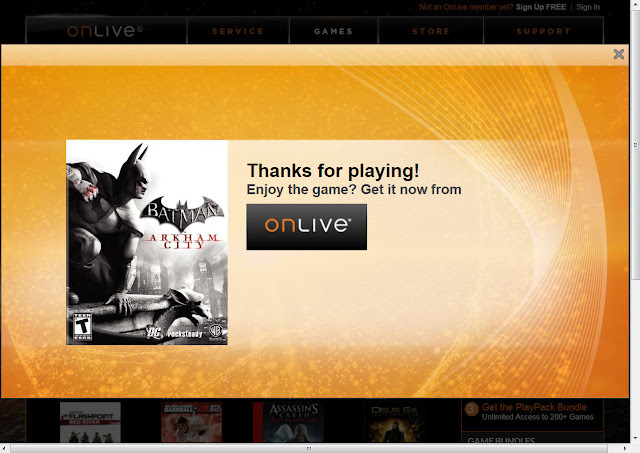 If you have the OnLive client installed, the system will default to that. If no client is installed the in-browser cloud gaming tech will be used to launch the demo via Java. If the game you want to demo is rated Mature you are greeted by an age gate, after that the demo launch process does a quick check, then displays a "Getting Ready" message, and finally you get the "Launching" message and shortly after that you're in the game. The OnLive demo starts up in a windowed mode like with Gaikai and like with Gaikai you can maximize the OnLive demo window to full screen. The OnLive demos support the same controller inputs like with the full OnLive service and the OnLive controller support is quite extensive. Because no signup is required, the OnLive In-Browser Cloud Gaming demos currently don't support OnLive's social features like friending, text messages, voice chat, Brag Clips, the Arena, etc. After the OnLive demo ends you get presented with options on how to purchase the full game. OnLive In-Browser Cloud Gaming is structured within OnLive's overall partner relationships as a potential revenue source, rather than as a demo expense, making it a sensible choice not only in terms of features, but in economics. OnLive's two-year track record of 100% uptime and meeting the reliability and security requirements of purchased games gives partners the confidence to not just demo cloud games, but convert them into cloud sales if they choose to. And, OnLive has a proven track record of delivering a great experience across all devices with commercial-grade reliability over both wired and wireless networks, supporting gamepads, keyboards/mice and touch, and offering the exclusive Universal OnLive Wireless Controller for TVs, tablets and smartphones, as well as PCs and Macs. OnLive In-Browser Cloud Gaming is backed by hundreds of patents and patents pending worldwide. With the launch of OnLive In-Browser Cloud Gaming it looks like OnLive is getting on Gaikai's turf and at the same time Gaikai will get on OnLive's turf by providing full game services like in their partnership with Samsung. It remains to be seen how successful both will be in the short term on each other's turf. Now this looks like it will become an all-out cloud gaming war and I'm curious to see what the next steps of both will be and what cloud gaming battles will be fought next. A little competition is almost always good for consumers and to grow the market. I'm sure both cloud gaming rivals will be even more motivated to fight on and develop exciting new services and products. Those who are interested in partnership opportunities and providing OnLive In-Browser Cloud Gaming can contact OnLive at bizdev@onlive.com.